4 Corner IT is focused on the productivity of your business and nothing is more important than a smooth workflow. Our team can put together a system that will streamline the work load, improving efficiency. CRM Integration is consolidation all of the companies account information into a centralized database so you and your team can get work done, rain or shine. You need to stay competitive, CRM Integration ultimately means not relying on your in-house data structure for day-to-day operations so you don’t have to be in the office to do business. Large or small, 4 Corner IT can accommodate any business and provide the tools to get you in front of the competition. Organization is without a doubt the most important asset in this day as we never know what to expect from our clients, partners and even employees. Everyday in the work place, a substantial amount of time is spent just looking for the information that your company runs on. Your company can increase productivity by sharing centralized information, bridging the gap between a small and medium-sized business. Over the years we have perfected this formula and are now able to provide these organizational services for our customers. 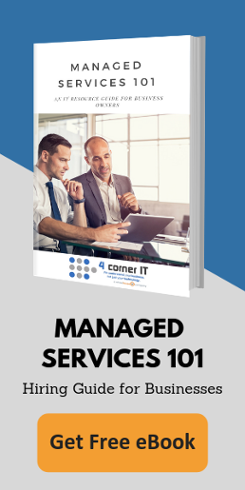 4 Corner IT has assisted several companies with organizing their databases as well as providing valuable knowledge to business owners and employees alike. All businesses can take advantage of CRM Integration regardless of size and small businesses can have an edge that will prove priceless in day-to-day operations. In fact, smaller businesses need to be more organized because of their size as every customer is almost irreplaceable, unlike larger companies that make up profits in huge volume. For over ten years, our team has been preparing, planning and executing CRM Integration deployments for all different types of industries from law firms to manufacturing. Being so close to your business on a personal level offers us a chance to see the inner workings and point out bottlenecks and inefficiencies. Our team is dedicated to your success and has the tools as well as the knowledge to do so.